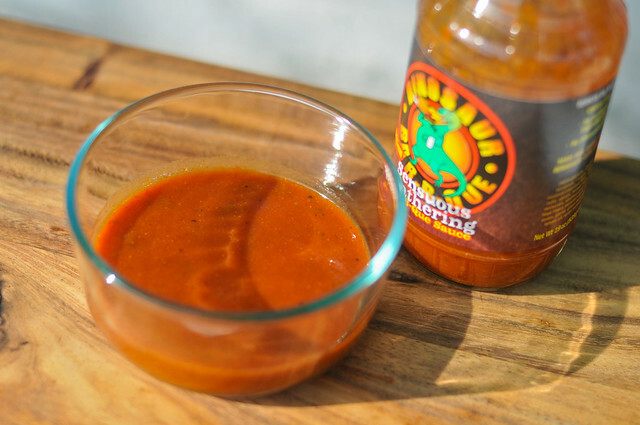 Loaded with excellent flavors and textures, Dinosaur Bar-B-Que Sensuous Slathering Sauce has a lot of good stuff going on. Even though it's a bit thin when cooked, there's no loss of the great balance between vinegar, sweetness, and spice. Dinosaur Bar-B-Que got its start with a 55-gallon drum and a whole lot of bikers. Pitmaster John Stage believed bikers deserved a good plate of food, so started cooking and selling barbecue with two partners in 1983 at the Harley Rendezvous near Albany, NY. After taking his show on the road for 5 years, he settled down in Syracuse and opened his first barbecue joint. Two years later the business expanded by tripling its space, adding a bar, and live music. In 1998, he opened up a second location in Rochester, then added a third in Harlen in 2004. This month saw the opening of fourth Dinosaur Bar-B-Que in Troy, NY. 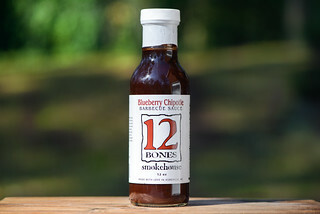 The years have not only brought more restaurants, but some national notoriety as some of the best barbecue through magazine features, a cookbook, and a full line of specialty sauces and rubs. This sauce has a lot of surprises with each consecutive smell taken in. First, like most sauces, a vinegar gives a little burn to the nostrils. Then a heavy onion aroma is next, followed by some sweet molasses and a little smokiness. No smell is too strong—they're all very well balanced and quite nice on the whole. This sauce is on the thinner side of medium thickness. It first drizzles off the spoon, then starts to glob as the amount of sauce lessens. The musky orange hue is lighter shade for barbecue sauce, and a lot of spices are visible along with small chunks of vegetables and garlic. Those chunks of vegetables and garlic give the sauce a bit of crunch and add a whole lot of flavor. A little sweetness on first taste quickly gets over taken by vinegar, which lingers, making it the dominate flavor. Then as you bite into the chunks, new flavors of onion, garlic, and my favorite, green bell pepper, make their way into the party. Each spoonful was delicious and slightly different, making this a very exciting sauce to me. Similar to uncooked, this sauce had a lot of good stuff going on after coated on chicken and grilled. The tartness of the vinegar mellowed and came into better balance with the sweet molasses, and this mellowing let the flavors of the onion and green pepper come out a bit more. I cooked two pieces of chicken using this sauce, and one I forgot to turn, which ended up burning a little, but if given the proper attention, the sauce developed a nice crust and baked into the chicken well. Like Bone Suckin' Sauce, the final coating was a little thin, but that didn't translate into any loss of flavor. 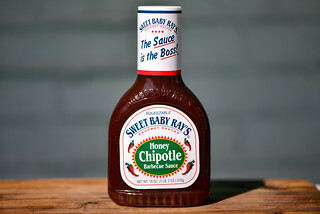 I thought this sauce was the bees knees. I really liked how the chunks of veggies and garlic enhanced the texture and flavor, making each bite a little different and very interesting. Although a little vinegar heavy uncooked, both raw and grilled, the sauce had a nice robustness that could go with just about anything. 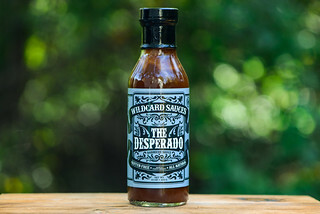 After some delicious chicken, I used this sauce to finish a rack of rib to excellent results, and in the restaurant I used it as a dipping sauce for pulled pork. 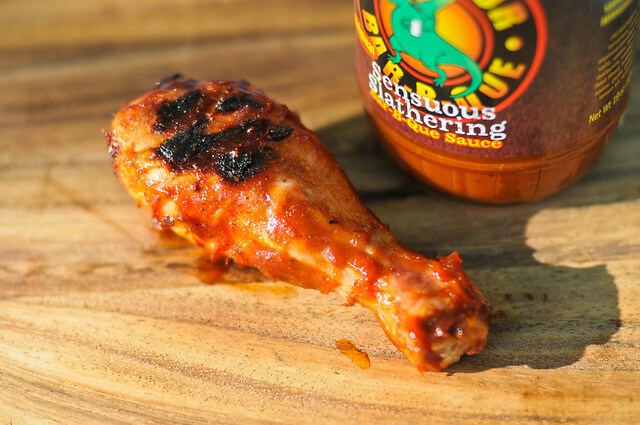 It's a great flavored, all purpose barbecue sauce that couldn't do any wrong. A friend of mine brought me back a bottle of this swill from New Yawk City. In my opinion we Texas natives wouldn't even dare to put that crap into our septic systems. 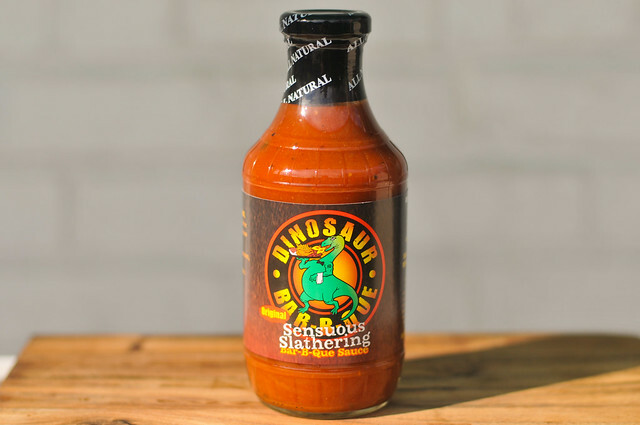 We really like this Dinosaur sauce on grilled chicken breasts and wings.